Whenever the Board of Directors of any group meets, there are usually specific items that need attention. These matters can be addressed either in the order of importance, immediacy or preference. More importantly, it is important the discussions do not get sidetracked to issues not related to the primary items. The downloadable Board Meeting Agenda gives the amount of detail needed to keep the meeting on track. It also provides the flexibility to allow for the discussion of other items. 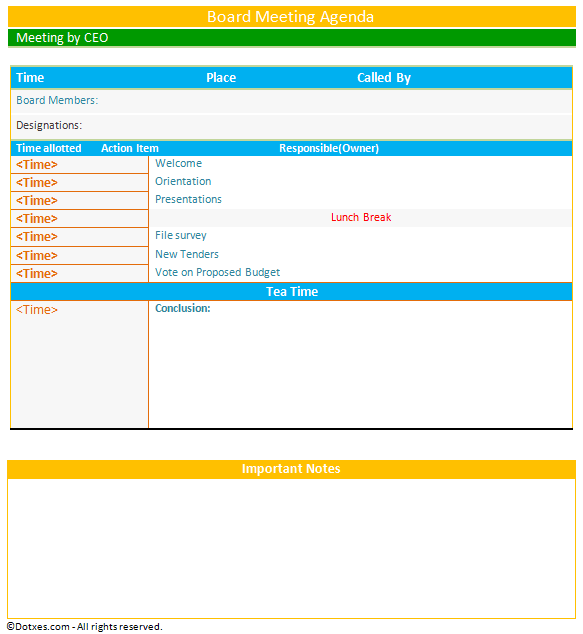 People often think of agendas as a list of items with each entry has additional sub-topics. For some organizations that will work. However, this template does an excellent job of keeping track of important details that some other agenda formats may not provide. First, it provides the time, and place for the meeting and who called the meeting. It could be the CEO, or it could be the Chairman of the Board. It may be called as a mandate of the company’s bylaws. It is always good to know who is calling the meeting. The template gives an area to list board members and designations. These could include chairman, vice-chairman, secretary, treasurer and possibly chairman of key committees. Next, when preparing the agenda, there is a space to set out a timetable for the routine matters. Such matters can include the welcoming, orientation or overview, and other similar items. Other items that may be in need of discussion can be handled in the conclusion section of the template. The area can be used for keeping key notes of the items that were discussed, or recommendations for future meetings. The template ends with a place for important notes. This area can be used by those in attendance to write down items or subjects they want to remember, or bring up future meetings. The left side of the agenda allows for a time to be set for each item. Time can include the starting time for each item or indicate how many minutes are going to be allocated to the subject. Designating the time is important because it keeps the meeting progressing, so it does not get bogged down on one subject. Every organization operates in a different manner. However, this template is a good starting point for preparing a workable agenda that will keep the participants on track as they discuss the items on the agenda.